Beechworth, a town in north-east Victoria, is about midway between Wangaratta and Wodonga, but 24 km south of the Hume Freeway. It is thus out of easy reach of the traffic along the freeway, and has avoided modernisation of much of its buildings and landscape. Beechworth is situated in a hilly region fed by several streams, one of which (Silver Creek) was the site of a gold discovery in 1852. Several other streams were found to be auriferous, starting the Ovens gold district. (The Ovens River is south-west, running through Wangaratta.) Silver Creek joins Spring Creek which in turn joins Reids Creek, all of which had rich gold finds. In 1853 a town was surveyed on Spring Creek and named Beechworth, the surveyor's birthplace in Leicester, England. Before the naming of Beechworth the locality was known as May Day Hills and postal services were provided by the Spring Creek post office. The village of Silver Creek was three kilometres east of Beechworth on the road to Stanley. In the early 1900s, it had three hotels, one lasting until 1920. Farm families kept the hotels going, along with the school (1882-93, 1897-1927). 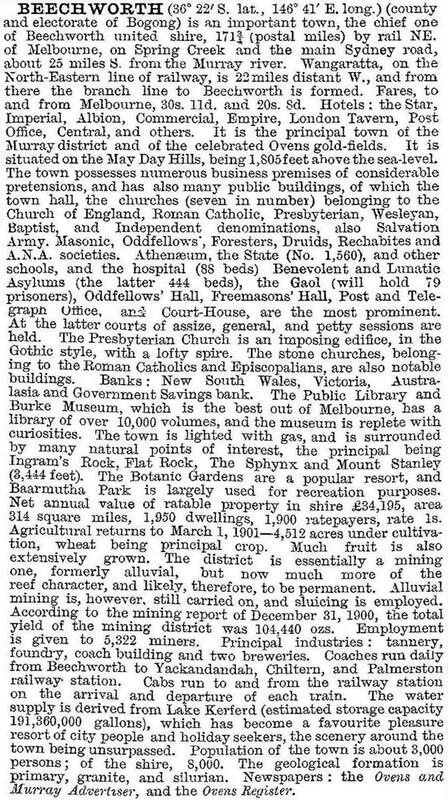 Beechworth's first amenities included hotels, the Ovens and Murray Advertiser (1855), the Ovens District Hospital (1856) and a library (1856). Education was provided by denominational schools and a National school was opened in 1858. There was a large contingent of police captained by Robert O'Hara Burke. After his death (1861) when returning from the exploring expedition to northern Australia, the Burke museum was established as an adjunct to the Beechworth library. The steady winning of gold led to further long standing amenities: Methodist (1856), Presbyterian (1857), Anglican (1858) and Congregational (1858) churches were built, along with a large Catholic church in 1868. In Ford Street government buildings comprising a police station and stables, a court house, a lands office and a forests office were built in 1857-58, forming what is probably the best regarded group of buildings in Beechworth. All are on the Australian and Victorian Heritage Registers. In 1862 a benevolent asylum (now an aged persons' hospital) was built, and five years later Beechworth gained a large government sponsored lunatic asylum (now the Mayday Hills Hospital). These buildings are also registered, and the latter is prominently positioned south of Beechworth, across Spring Creek. The asylum supplemented a large government gaol (1860). On 11 September 1863 Beechworth was proclaimed a borough. This was a formalisation of the municipal incorporation of the town seven years before. The town council laid out a botanic garden (now Queen Victoria Park), lent a large public reserve to the local racing club (now Baarmutha Park) and laid on a reticulated water supply. During the 1870s the Hurdle Swamp was made into Lake Kenford (named after a popular parliamentarian) and served as a more reliable water reservoir. Beechworth's population reached about 2500 during the 1860s, but did not move much higher. Gold was a finite resource and population was drawn more by jobs than town amenities. Beechworth was also off the main Melbourne to Sydney Road and railway. Lobbying gained a branch railway line to Beechworth in 1876, despite criticism that the line would only serve government departments, an asylum and a gaol. Within a few years the railway line was seen as a way of bringing travellers and vacationers to Beechworth. In the 1890s the Beechworth Progress Association published a book describing the town's attractions – mainly rock formations and landscape – and Beechworth's potential as a sanitorium was praised by the novelist Ada Cambridge who was also the wife of Beechworth's Anglican Dean. Beechworth, however, did not surmount the population threshold that would have continued its separate municipal status, and in 1871 it was united with Beechworth Shire. Beechworth's next fifty years were characterised by a reluctant admission that gold mining was finished and a lament for better days. Wangaratta, on the Hume Highway, had 3700 people compared with 2624 in Beechworth in 1921. In 1947 the figures were 6700 and 2900. The grand Ovens District Hospital, once the only one in north-east Victoria, was replaced with a smaller building in 1940. The roofless shell stands as a monument to past grandeur. The closure of the Beechworth Grammar College (1874-1910) was followed by the closure of the technical school (1912-30) which amalgamated with Wangaratta's. Fortunately a high school opened in 1912 but declining enrolments later caused the loss of Leaving Certificate classes which were not revived until 1957. Inhabitants of Beechworth who returned after several years' absence remarked on how little changed was Beechworth's built fabric; only the actors had changed. Tourist promotion continued to emphasise natural features and landscape until the 1960s when the National Trust drew attention to Beechworth's unique built heritage. Enthusiastic Melburnites saved and restored the powder magazine in 1965, and in 1968 the Trust and the Council devised an environmental area for the preservation of selected buildings and the encouragement of sympathetic design for new buildings. Most of the town is a conservation area under the Register of the National Estate. In addition to Beechworth's lack of twentieth century progress having caused little danger to most of the buildings, their durable granite and fine stone-masonry also ensured their longevity. In the 1970s the meagre guest accommodation in Beechworth's four hotels was supplemented by five motels. An annual Easter Golden Horseshoes Festival has been held since the 1960s, recalling a much described event when a local parliamentary candidate rode a horse shod with gold horseshoes. The festival possibly was a salve to the closure of Zwar's tannery in 1961. Beechworth had relied on the gaol and asylum employment in the past and ironically found itself relying on the Trust and the shire's popularisation of its past. The Burke museum was enthusiastically maintained by a local historian in the 1950s and assisted with a government grant in 1973. Several buildings were restored by newcomers. All the events appear to have overshadowed any desire by local people to form an historical society. In addition to the amenities already mentioned, Beechworth has a main street shopping centre marked by a grand post office at the corner of Ford and Camp streets, several parks and reserves, a golf course, a swimming pool, tennis courts and bowling greens. There is a secondary college (241 pupils, 2014), State (188 pupils, 2014) and Catholic primary schools and four churches. The former Council's shire hall and a memorial hall provide ample public meeting places. Spring Creek flows around the southern and western edges of the town where it enters a spectacular gorge and the beginning of Beechworth (State) Park. Little or no trace remains of the railway line (1876-1976). Beechworth's historic cemetery has Chinese towers (1857) used for burning paper prayers and food for the dead. They are the most enduring monument to the Chinese gold miners. Dame Jean McNamara (1899-1968), born in Beechworth, was a pioneer in the treatment of polio and a persistent advocate of myxomatosis for the control of rabbits. She is buried in the Beechworth cemetery. Between 1981 and 1996 Beechworth's employment pattern changed by nearly a halving of community services (59% to 35%) and a doubling or more of employment in wholesale/retail trade and recreation/personal services, which in 1996 together comprised 33% of total employment (census figures). In 1996 La Trobe University purchased the Mayday Mills Hospital for use as its Beechworth campus, comprising more than 100 ha with heritage gardens and listed buildings. The campus was closed in 2011 and sold.